Event, funded by Women in Green, discusses full extent of Jewish, Israeli involvement in Uprising, tells unknown perspective. 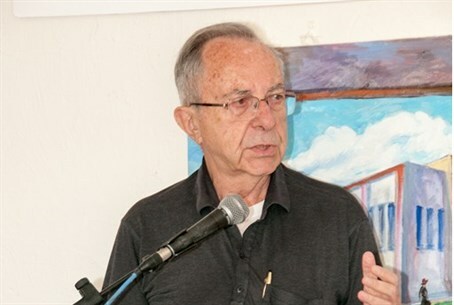 Former Minister of Defense and Foreign Minister Professor Moshe Arens visited the Jewish village of Shdema in Gush Etzion on Friday, and told a new version of the story of the Warsaw Ghetto Uprising. 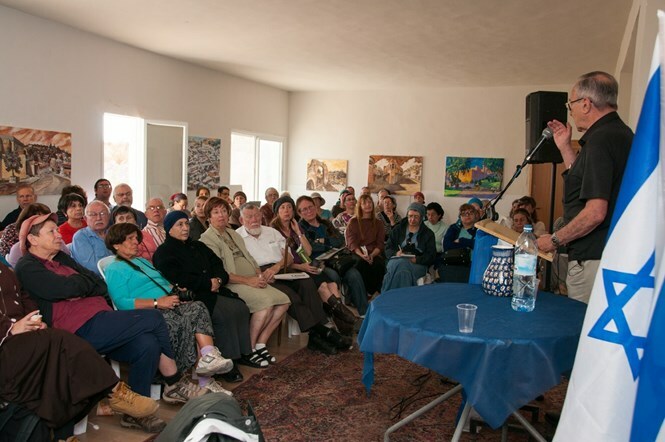 The event was organized by Women In Green (Nashim B'Yarok), a grassroots organization which involves women in efforts to maintain the security of Judea and Samaria's Jewish residents. Arens started off by referring to how difficult it is for most Jews in Israel to comprehend the reality in those days, when Jews were being led to the furnaces, allegedly without resistance. He then spoke about the meeting between representatives of the Jewish communities in Kibbutz Yagur with Zivia Lubetkin, who had escaped from Europe and arrived in the Land of Israel, and who then told them of the Uprising in Warsaw. “Zivia Lubetkin spoke Hebrew fluently and told of the Warsaw Ghetto Uprising to the hundreds of participants, who were eager to hear of the Jewish fighters. But the story she told was only one half of the story,” claims Arens. “Two organizations took part in the fighting during the Warsaw Ghetto Uprising: the well known organization which is studied in Israeli schools, the ŻOB (Żydowska Organizacja Bojowa, Jewish Combat Organization), led by Mordechai Anielewicz, an organization which included all the Left-Zionist organizations, and the other organization," Arens explained, "and the ŻZW (Żydowski Związek Wojskowy, Jewish Military Union), led by Beitar members and Jabotinsky’s disciples, some of them Irgun members who established operational cells." Arens pauses to deal with the the question of the lack of Jewish resistance to the murders and massacres that were committed against them. “People felt isolated, without an organization or military, facing the strongest army in the world," Arens said. "People were concerned for their families. At the same time, the Germans planted the idea among the Jews that not all of them would be killed, that those who worked in their factories and operated for their police force and the Judenrat would survive, along with their families. There was a general feeling that resistance would bring devastation down upon them all”. Arens notes that the mass murder of European Jewry began in the summer of 1941. “Before then, the ghettos were created and many Jews died in them from diseases and epidemics. Murders were committed, but it wasn’t mass murder yet," he explains. "When the German army invaded Russia and the Ukraine, special units were established with the purpose of the targeted mass murder of Jews by shooting." Arens then explains information not widely known about the uprising. "In Paneriai, a neighborhood of Vilnius, 30,000 people were murdered, and that is where the first Partisan organization was established, the unified organization that included everyone. At its head stood a Communist and his Beitar and Ha’Sho’mer Ha’Tza’ir lieutenants." "Their first operation was sending 4 youths to Warsaw, no easy task under the German regime, with the objective of informing the people of Warsaw that the Jews were being murdered. The greatest concern was that the information wasn’t getting through." Yet it turns out that despite the efforts to alert and warn the people, no one heeded the warnings. “The 4 youths arrived in Warsaw and told of the murder of Jews in Vilnius and the establishment of a resistance movement and that ‘you can expect the same thing. You have time to organize a resistance and fight’," Arens recounted. But, "Warsaw Jewry refused to believe it. They thought that as things stood, they were under German occupation, yet it had not happened, there was no mass murder. There were those who believed that perhaps such a murder could occur, but only in a place that was previously under Soviet regime and not here, in Warsaw”, says Arens, and points out that there was some opposition to the very spreading of this information, as it might invoke German wrath. 6 months later, on the 9th of Av, 1942, the shipment from the Warsaw Ghetto began, and about 10,000 Jews were sent to the furnaces of Treblinka every single day until Yom Kippur. “They were told they were being sent to labor camps, yet the fact that the shipments were comprised of the elderly, disabled and children, indicated otherwise. The trains returned empty and they became aware they were being sent to Treblinka. 270,000 people were transferred with no resistance. People wanted to believe that it was possible to survive. There were rumors that today’s shipment would be the last and rumors that the Germans were taking 70,000 and then they would stop and take no others, but these rumors were soon proven wrong. These rumors prevented even the spark of resistance." At the end of these shipments, when 50,000 people were left in the Warsaw Ghetto, the awareness that the Germans really did intend to kill them all, regardless of whether or not there was any resistance, started to sink in, and the resistance began to form in the 2 organizations. According to Arens, at this point the Jews of Warsaw were having difficulties establishing a single unified entity to fight the Germans. “The Left-wing organizations didn’t want to involve Beitar and Jabotinsky’s people. Today it is difficult to comprehend this refusal and understand how there were such differences in face of the Nazi threat which did not differentiate between various Jewish schools of thought, yet in the Warsaw Ghetto, even prior to the shipments, life was conducted, both politically and with the youth groups, as it had been before the war. The participants were taught that Jabotinsky’s people are fascists who killed Arlosoroff, and are therefor outcasts. As Israeli Prime Minister David Ben-Gurion would later say, ‘No Herut and no ICP (Israeli Communist Party)’, this was the mentality of the combatants." The ŻZW, led by Paweł Frenkiel, was established due to this split, and the forces were ready for the Uprising, which broke out on Passover Eve of 1943. . During these talks, Anielewicz and Frenkiel, along with their people, sat across from each other and could not reach an agreement. “If it was difficult to understand why 2 organizations were established, it was much easier to understand why they had difficulties merging together. Anielewicz’s organization was political and less militant," Arens stated. "His people were youth group participants. On the other hand, Frenkiel’s organization had a more military styled construct, people with military backgrounds who fought in the Polish army and trained in the Irgun’s cells. Anielewicz’s people couldn’t accept a situation where Frenkiel would command the fighting, despite being the most qualified”. “Most of the weapons the combatants had were purchased in Warsaw after the Battle of Stalingrad”, says Arens. “Warsaw had a train stop for soldiers returning from the battles and a large arms market was developed. Money was obtained in various ways and the weapons had to smuggled into the Ghetto. Pistols could be passed over the fence, but the ŻZW also had a machine gun, which was smuggled through a tunnel under the Ghetto’s fence”. Prof. Arens returns to Zivia Lubetkin’s story in front the people of Yagur, in the Land of Israel, and points out that she never told of the ŻZW’s struggles against the Nazis, despite knowing they existed and despite having been present in the meetings between both sides. “She understood how things were perceived in Israel, with The “Saison”- Hunting Season mentality and the persecution of the Irgun members. As far as she was concerned, the people of the Kibbutz movement gathered in Yagur and there was no place for sharing the story of Irgun heroism”. “18 years later, during Eichmann's trial, even when the witnesses were called to tell of the death camps, public figures were called forth to talk about the bravery of fighters, and for this task Icchak Cukierman, Anielewicz’s lieutenant, and Zivia Lubetkin were brought in. Even during Eichmann's trial, Ben Gurion had no interest in telling the heroic tale of his political rivals”. Anielewicz and Frenkiel had different plans for the fight against the Germans. Frenkiel wanted to have a direct confrontation with the German army and to that end they positioned themselves at Muranowska Square, raised the Zionist flag, later to become the Israeli flag, and the Polish flag. Himmler had the flags taken down and for a few days a battle was waged over the flags”. There was no one to tell of this battle, because Paweł Frenkiel and his men were killed in the fighting. Anielewicz was also killed, but Lubetkin, Cukierman and dozens others escaped through the sewage pipes, came to Israel, wrote books and told their half of the story. There was no one left to tell the full story”. Due to the suppression of the full story of the fighting in the Ghetto, the only comprehensive and reliable source remaining to study the details of the battles were the German records. General Jürgen Stroop, commander of the forces, issued a daily update, and sometimes twice a day, with a detailed description of everything that occurred each and every day. All these operational reports were collected by the General into a sort of special scrapbook to which he attached photographs from the photographer who escorted him around the Ghetto, the same famous photographs from the Warsaw Ghetto, including the most famous photograph of the young boy raising his hands. Later on, Stroop was captured and the album became part of the indictment against him. The documents reached both global and Israeli press. Prof. Arens points out that the 20 NIS bill has President Ben Zvi’s speech from the day Israel joined the UN printed on it. Ben Tzvi spoke then of the blue and white flag that was raised over the Warsaw Ghetto, but didn’t mention who raised the flag, “possibly because he didn’t know and possibly because he didn’t want to talk about it”. 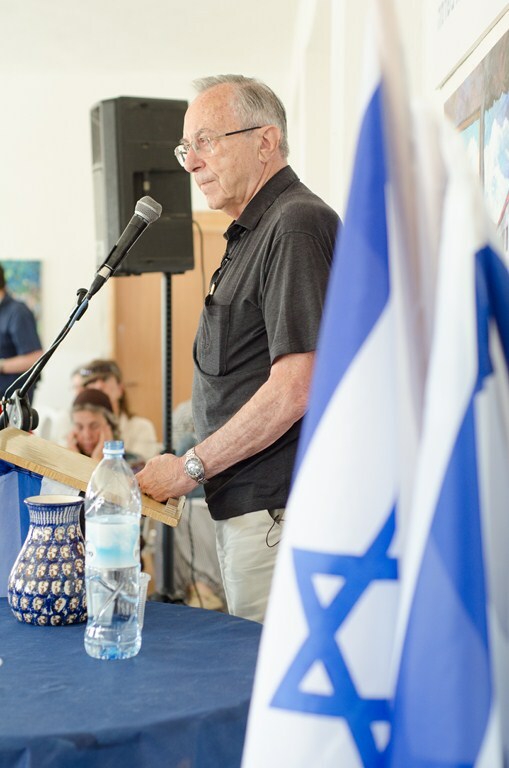 At the end of his speech, Prof. Arens reminded participants of Menachem Begin’s often cited motto ‘the Truth will prevail’, stating, “I truly hope that in the case of the Warsaw Ghetto Uprising, the Truth will once again prevail”. After his speech, Arens answered several questions that were directed to him by the large audience in the Shdema all. Among other things, Arens was asked about the treatment the ŻZW receives in the Yad Va’Shem institute. He says that although there is a small commemoration of the organization and its part in the Uprising, this is a minor, token mention, especially in comparison to the full extent of the organization’s actions and significance. In response to another question, he shared that only after his book about the struggle came out did Yad Va’Shem personnel organize a lecture for him but only before a small crowd. According to him, Yad Va’Shem has a perception that all the Jews of that time were good, and there is no room to criticize their actions, and the same applies to those who chose not to fight and to the Judenrat, but we must remember that there were those who were not so good, as he puts it. A video summarizing the day's events - with English subtitles - is available above. Pictures from the event are below.